The top ten winery Web sites of 2005 stand out for their "visitor effectiveness." Everyone arrives at a Web site with a goal already in mind. The best winery Web sites make it easy for visitors to accomplish what they came to do, and that’s good for wine aficionados and wineries alike, particularly during the holidays. The scores are based on a total of 100 points, using 25 rating elements designed to evaluate the "visitor effectiveness" of a winery Web site, from search ranking to site freshness. The median score for all 2,231 winery sites included in the survey was 48 points, with a mean of 47.72 points. "The best sites clearly address the needs of four distinct types of visitors: buyers, browsers, the trade, and the media," said Michael E. Duffy, publisher of The Winery Web Site Report. "Each of these groups increasingly uses the Web as their first point of contact with a winery. An effective site helps a visitor accomplish what they came to do without a lot of effort wasted." Wineries interested in knowing their overall visitor effectiveness rating can request it free of charge at http://www.WineryWebSiteReport.com. "A median score of 48 points shows most winery Web sites aren’t doing as much as they should for their visitors," adds Duffy. "Smart wineries realize that the recent Supreme Court decision regarding direct wine shipments means both new potential customers and more competition. Visitors want sites that look fresh and make it easy for them." Please direct questions regarding this release to Michael Duffy, publisher of the Report, at 1-888-946-3799 (1-888-WINERY-WEB). The Winery Web Site Report offers each winery a printed report specific to their Web site, as well as a year of online access to current statistics, summary evaluations of all wineries in the database, and expert assistance via e-mail. The printed report contains a best practice checklist and statistical measures for each of the 25 rating elements, providing clear direction to wineries seeking to improve. More information is available at http://www.WineryWebSiteReport.com. 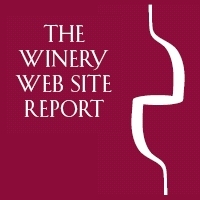 The Winery Web Site ReportThe Winery Web Site Report logo, representing bottle, wine, and wine glass.